It was a late afternoon and the summer sun still beating down on the city when I headed west on 3rd street in the heart of Los Angeles in search of tacos. My search for finding taco truck activity was getting desperate when I realized the no parking before 7pm signs on one side of the street. I was about to try another Blvd when I noticed a taco truck in the horizon. Was it a mirage? a taco mirage? As I got closer I saw the trucks name , El Taco Movil. El Taco Movil translates to the mobile taco. 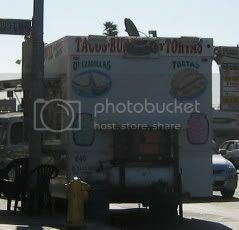 Clever name for a taco truck but my favorite name for a taco truck is still El Matador. El Taco Movil has a full menu of mexican fare with chorizo, lengua, cabeza, asada, pastor. I ordered al pastor and carne asada and popped open a bottle of coke. A counter with salsas and condiments awaited my naked tacos. I topped some onions, cilantro and salsa roja on them and took a seat on one of the chairs. The al pastor was rustic and heavily spiced and went just right with the spicy salsa roja. The roja was complex with a hybrid of chiles. I could taste guajillo chiles among them but couldn’t make out the others. The roja was one of the best salsas I’ve tasted on this taco hunt. The salsa was so good it made the tacos so much better than they would have been with a weaker salsa. The meats were well prepared but this salsa, wow it was special. Next I hit a taco truck parked outside the Jons supermarket at 8th and Ardmore that showcases a large al pastor spit. 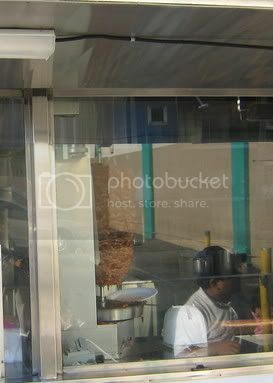 The truck called Tacos Taluca has no menu, just a large spinning hunk of pork that can be viewed through a long window.After announcing my order the cook cut slices of pork off the spit and on to the grill where they sizzled and then were scooped up with two toasted corn tortillas. The salsa, a smooth tomato and cilantro based salsa was delicious. It was unlike the usual taqueria salsa roja and had a garlic and jalapeno taste. It went very well with the pork which was excellent. I don’t think I’ve ever had a bad taco from an al pastor spit. I did find a couple fatty bits but overall these were great tacos. Night started to fall but I wasn’t done with my conquest of this taco-centric area of Los Angeles. 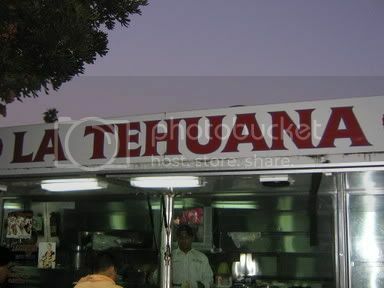 I found myself back on 3rd street at a taco truck called La Tehuana . I found a long truck with crowds of people hanging around. Some were loitering and looking for handouts but most were leaning up against the back wall waiting for their orders. You know a taco truck does good business when they not only have their own customized t-shirts but they give you a reciept with your order number on it. I watched while mounds of beef and pork smoked on the grill with the cook constantly pressing down on the meat with his kitchen tools and dicing up the finished product. There were also bowls of salsa rested at the counter with cups to take salsa to go. They had all the bases covered. When my tacos were ready I walked back to my car and sat on my hood to enjoy them. With an ice cold bottle of orange soda in one hand I reached for one of the medium sized tacos. Not knowing which one I grabbed I soon felt the sweet sensation of pork fill my mouth. The pork was tender and sweet and with the intense salsa roja and the orange soda I was in taco heaven. The roja reminded me of King Taco’s firey hot sauce. The carne asada was great also. 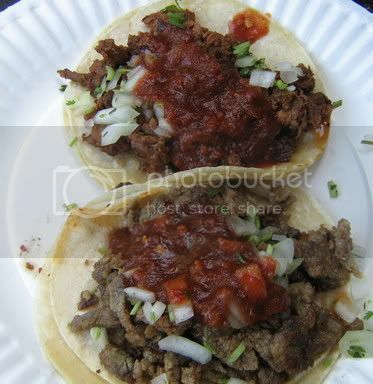 The beef was shaved and finely cut and very tender.These were pretty big tacos and at only $1 each quite a deal. W 3rd st and S Ardmore. 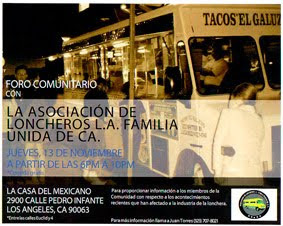 tacos $1, 7pm-?? 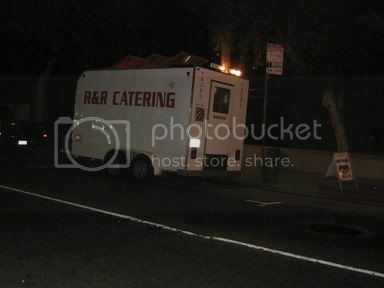 I thought my night was over but when turning left at Western and 3rd I saw a taco trailer called R&R catering. Upon closer look this trailer also had bacon wrapped hot dogs on the grill as well as a grilled onions. A table adjecent to the trailer had two different salsa rojas, a salsa verde and a guacamole salsa. There was also a small TV that was showing world cup highlights. The tacos were small but very tasty. Both meats were tender and the smokey salsa roja and sweet grilled onions were excellent condiments. I would have ordered more tacos and tried their other meats if I wasn’t already so full. During the drive home I wondered where my taco journey would take me next. 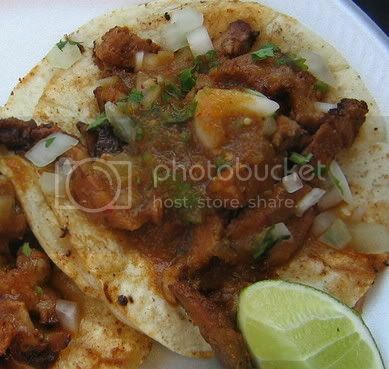 Certainly I must head to Cheo’s , the famed taco truck in El Sereno and there is El Taquito Mexicano, Pasadena's finest taco truck and of course Leo’s tacos in eagle rock and the hundreds of other taco trucks that roam the city.One day I will climb that mountain and try them all. Only then will I be able to call myself a taco conquistador. bandini I must say you are driving me loco seeing all your posts about your wonderful finds. Man, this could almost make me miss living in Koreatown. 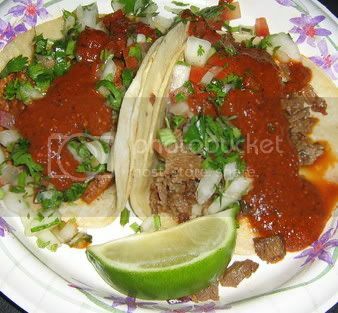 However, from my current haunts in Mar Vista, a number of excellent taquerias (Taqueria Estilo Mexico, Taqueria Sanchez, Don Felix) and trucks (Tacos Chatos, La Isla Bonita, the sorely missed Tacos Junior) are but a short bike ride away. You still need to review Qué Ricos, though. When their pastor is on, it's on, and I have yet to find a birria/barbacoa burrito that can equal theirs. I double salute you, Bandini! I can't believe you did all of this 'research' in one night! Amazing. Thanks, as always for the stellar reporting and photos. Y'know, I actually like a little bit of gristle in my asada. Maybe that's just me. You were right about LAX Tacos, I should have listened. But I live in Inglewood, and you're not getting down here enough to provide guidance. 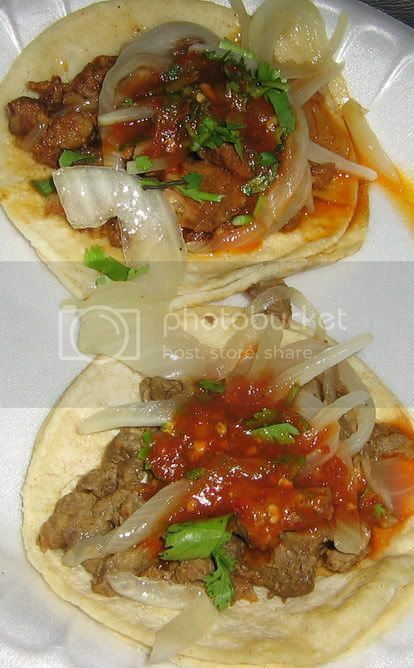 Fortunately another commenter mentioned Acosta Tacos. I live there now. I'm also fond of Don Amigos, but they're only open till 9pm. Should you find yerself over this way, and wandering into the House of Tacos on Market street, they serve 'em up with lettuce and cheese. For this reason I can't recommend the asada, but do-oh-do-oh-do try the fish tacos. Come to the valley, I will buy you a Jarrito. I live right by Tacos Taluca and man do I dig their pastor. Your sidebar is fantastic. I have printed it out so I can keep it in my car. Tacos are uncharted territory for me but I think that's about to change. By the way, as I understand it, "El Taco Movil" can also mean "The Tacomobile." Can I put in a shameless request to be added to your blogroll? bandini you are the man! you should start charging people for taco tours. one day you should collect all your entries and publish a book. keep up the awesome reporting! How funny are you in your taco quest. May I reccommend to you Tito's Tacos in Culver City? They always have a line, but they never disappoint. Congratulations and enjoy your Honour. Did ANY of these people have "mobile" taco grills...like for parties!? I'm in need of someone to grill tacos for my son's 13th birthday fiesta!